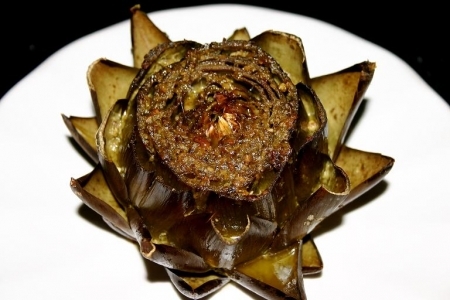 Artichokes are delicious and can be made many different ways. This particular recipe uses fresh artichokes that are perfect for dipping in the sauce along with some bread. Not only are they very easy to make, but make a great statement to serve your guests as a first course. Serves 4 as an appetizer. Cut the stems off of each artichoke to create a stable base. Cut an inch or two off of the top of the artichoke to remove the spiny tips of the leaves and to reveal the little gaps between the leaves. Place all artichokes into a large Dutch oven or pot. Stem side down so that the openings of the leaves are exposed. Sprinkle each artichoke with kosher salt. By sprinkling the artichoke with kosher salt prior to pouring butter mixture flavored the inner leaves perfectly. In a small pot over low heat stir remaining ingredients together and cook until butter has melted. Once melted, pour evenly over each artichoke. Cover and place into a preheated oven at 300 degrees for 1 1/2 hours. Time may vary depending on size and freshness of the artichoke. Every 30 minutes baste the artichokes with the pesto butter sauce. Once the artichokes are thoroughly cooked or until outer leaves can easily be removed, remove from oven and place onto a serving dish. Pour remaining butter sauce over each of the artichokes. Serve with sliced artisan bread for dipping. The leaves on these artichokes came off easily however the first layer of meat was still a bit tough. Once you went past the outer layer of leaves the artichoke was cooked to perfection. Once you get to the heart, remove hairs with a spoon and discard and continue to enjoy the heart. If desired sprinkle a little Kosher salt on the heart.